In early November, the completion of several multi-year construction projects left the views around the Market Square unimpeded. A Krakow native remarked, “It could have looked like this all the time, but they had to wait for the elections”. In her sceptical view, the local election campaign had jolted officials out of their lethargy. As this goes to press, we do not know who will win the run-off for mayor, but we can enjoy the fact that the city looks as good as it has in recent memory, and boasts new attractions like the Aviation Museum, the World War II Museum at the Oskar Schindler factory, the historical museum in what were recently archaeological digs beneath the Market Square, or the newly renovated gallery in the Cloth Hall with its cafe overlooking the square. Some locals looked askance when that cafe was mooted, but in fine weather the place is a joy. Sipping a latte on that elevated terrace is like being in a private box in the VIP circle. You gaze down at the tourists and flower sellers, and then turn your head and see close-up a gigantic gargoyle you had previously only squinted at from a distance. Then there’s the new Museum of Modern Art in the Zabłocie [Podgórze?] district, which only yesterday exemplified post-industrial grimness. Like the Aviation Museum, the Modern Art Museum is the work of an “outside” architect. Leading European designers are finally giving us a break from the local regulars whose masterstrokes were becoming familiar. All these new attractions, and there was already so much to see and do, like the 20th century collection at the Main Building of the National Museum, the Bunkier Sztuki with its many events and delightful cafe, theatres large and small, the clubs, the cafes, and the churches (which seldom have problems finding the money for conservation). Not to mention Wawel, and even the rebuilt football grounds. Even projects people cavilled at, like the Opera or the Mały Rynek, were surely better than what used to be there. All of this within the architectonic, urban setting that survived the cataclysmic past century. So, whether the local elections spurred the completion of major projects, or whether those projects bore fruit at around the same time because most of them broke ground when Polish accession to the European Union made new funding available, the city has achieved a sort of culmination, and it is tempting to step back and say, this is the way it should be. This is Krakow in full. But the Christmas market on the Market Square reminds us that enough is never enough. 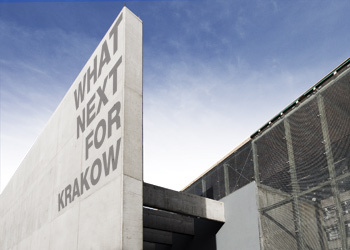 Krakow seems to have it all, like a beloved, prosperous uncle – and so, what next? What do we give him for Christmas? Another big museum, a new philharmonic hall, or maybe the convention centre that was relegated to the deep freeze in order to refurbish Wisla’s stadium (back in the days when the city anticipated hosting 2012 European championship matches…talk about dodging a bullet)? A couple more shopping malls, or perhaps cycling trails that go where you want to go? What do you give to the city that has everything? On the one hand, this is the long-term threat hanging over Krakow. There are times when it seems that mechanisms are at work behind the scenes in the city resembling the plot of native son Roman Polanski’s Chinatown. That’s the one about property development in 1930s Los Angeles, which produced a city of bottlenecked freeways, shopping malls, and residential districts 50 miles from downtown, with 75 percent of its best real estate given over to cars in the form of streets, highways, or parking lots. Today in Krakow we have traffic jams and outlying shopping malls with indistinguishable line-ups of stores, while neighbourhood businesses are boarded up. Getting interesting food means tramping to the Old Town or Kazimierz, or fussing over your own stove with stuff you dragged home from the foreign-owned hypermarket in the mall of your choice. On the other hand, the statement about what happens when development kicks in could have been made at any point over the last 20 years, but it hasn’t happened yet. To the contrary, in Kazimierz the city has developed a successful alternative urban focal point – something regarded as an impossible dream two decades ago. Young entrepreneurs have opened boutique hotels, hostels, and active tourism options that consistently garner international awards at a rate unmatched by any other city between Berlin and Tokyo. There’s franchised fast food, but one of the most dynamic brands is a local venture pushing not pseudo-American but approximate Caucasian. For every “real” restaurant that opens another goes bust, but that’s what restaurants do. The tourists off the low-cost carriers are not so much stag-party louts as middle-class, well-informed people who chose their destination because it abounds in noteworthy things and has a decent standard of urban life. As they’ve been doing for decades, a percentage of the weekenders like the place enough that they decide to stick around. So what’s the message for the future? As in so many areas of life: don’t screw it up. Merely solve the transport and parking problems without impinging on the fabric of the city, revitalise the neighbourhoods, and give local business start-ups the infrastructure and encouragement they need, so that clever young people stick around. Square the circle. Mayor of Krakow? No sweat. Or, as you say to that uncle who has everything when you hand him the gift-wrapped aftershave: “Just keep being yourself”. William Brand has lived in Krakow since 1983. A full-time translator, he has rendered into English works by Ryszard Kapuściński, Stanisław Lem and Grzegorz Kołodko. ← Was Christopher Columbus Son of Polish King?